Armen Deukmedjian, MD is a fellowship trained neurosurgeon, specializing in minimally invasive solutions for both simple and complex spinal pathologies. His focus is on surgical and non-surgical treatments of debilitating neck and back pain. Dr. Deukmedjian earned his bachelor’s degree in molecular and cell biology from the University of California San Diego, followed by a Master’s Degree from Georgetown University in physiology. He subsequently attended George Washington University for medical school and earned his MD with highest distinction, being named to the Alpha Omega Alpha honors society. After medical school, Dr Deuk completed a seven-year residency in neurosurgery at the University of South Florida, during which he spent the majority of his time focusing on spine surgery. During a research year, Dr Deukmedjian authored and co-authored over 15 peer reviewed articles in top tier neurosurgery journals and 10 book chapters. He also spent that year earning a fellowship in minimally invasive and complex spine surgery sub-specializing in lateral minimally invasive approach to the thoracolumbar spine. After residency, Dr Deuk worked as an assistant professor in the department of neurosurgery at the University of South Florida. He greatly enjoyed the variety of spinal pathology seen as well as the opportunity to help in educating neurosurgical residents. Part of his practice included working with the James Haley VA neurosurgeons in assisting with complex spine reconstructions. Dr Deukmedjian’s surgical interests include degenerative scoliosis correction, spinal arthritis, and treatment of neck and back pain. However, he also treats spinal trauma, fractures, tumors, and congenital defects. His personal interests include spending time with his wife and growing family. He also enjoys scuba diving, outdoor running, and the Los Angeles Lakers. But most of all, Dr Deukmedjian enjoys helping his patients overcome longstanding pain using a multimodal approach, not solely relying on surgery. 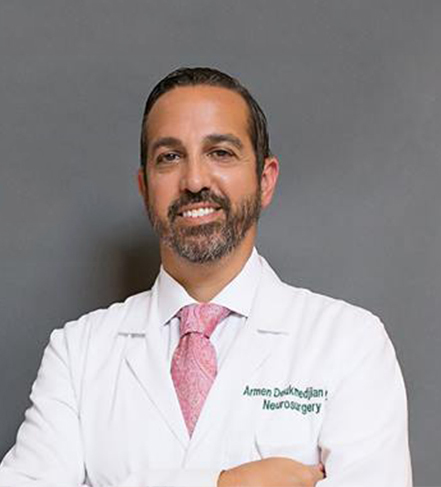 Dr. Amir Ahmadian MD, is a Fellowship trained Neurosurgeon who specializes in complex minimally invasive spine surgery. He earned his bachelor’s degree in Neuroscience and Behavior Biology at Emory University in Atlanta, GA. He attended Medical College of Georgia School of Medicine where he obtained his M.D. degree at the top of his class as member of Alpha Omega Alpha honor society. 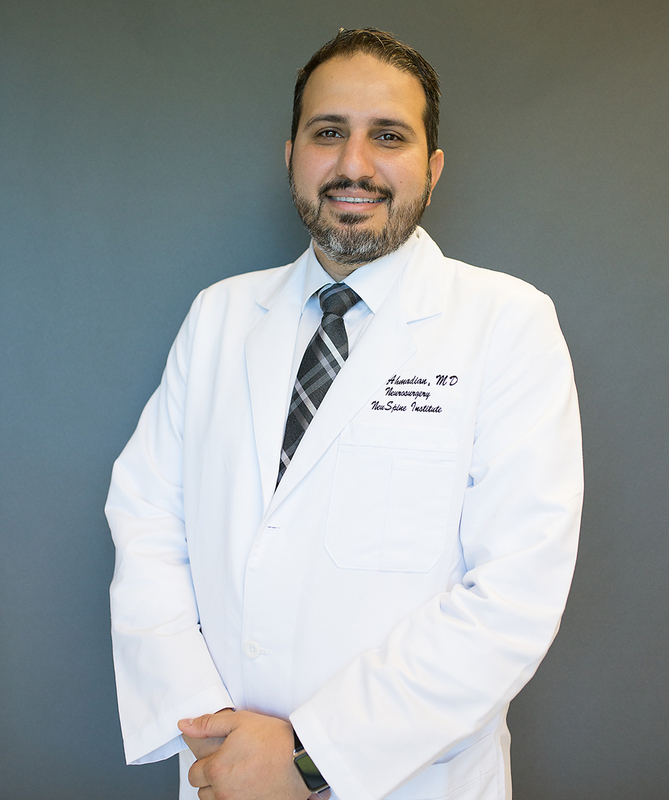 Dr. Ahmadian completed his Neurosurgical residency at University of South Florida where he served as the Chief Resident. As a gifted teacher and researcher he has authored over 21 peer-reviewed journal publication and 10 book chapters in the field of Neurosurgery and spinal Deformity. He has presented in various national professional meetings and is an expert in the field of Minimally Invasive Spine Surgery and Scoliosis. Dr. Ahmadian completed a clinical fellowship in pediatric spinal deformity and scoliosis at Alfred. I. Dupont Hospital for Children in Delaware and continued his education at Shriners Hospital for deformed children in Tampa during residency. Furthermore, he has served our veterans at James A. Haley Veterans Hospital and at the Moffit Cancer Center and brings a unique expertise in minimally invasive surgery, scoliosis and adult neurosurgery. He specializes in management and treatment of spinal deformity with minimally invasive surgery, scoliosis, spinal fractures, neuro-oncology, peripheral nerve and trauma. Dr. Ahmadian’s practice philosophy is patient centered care and targeted treatments of clinically relevant pathologies. He employs a team approach to patient care that involves not only the patient and his/her family but also their primary care physicians and other members of the medical staff.